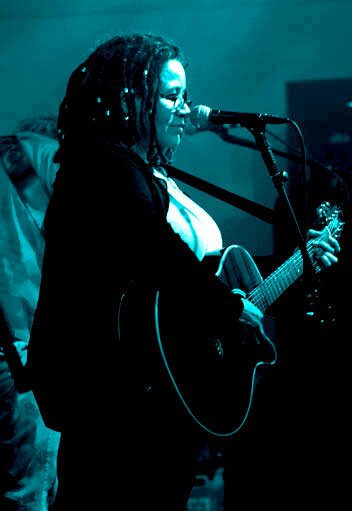 Singer, songwriter and musician Jeanette Murphy is an unsigned independant recording artist from London, UK. Jeanette has a wealth of experience on stage as an acoustic singer and songwriter, where she performs an effortless mix of guitar, stunning vocals, and thought provoking lyrics, to create a truly unique style that is very much her own. and with it comes a new band. The JEANETTE MURPHY BAND... are one of the few bands that openly embrace an eclectic mix of genres. They are a talented bunch of music lovers with a broad range of influences, who tend not to allow pre-determined musical genres to limit their range. Plus surprise special guests from south west London’s Irish music sessions. The songs are said to be "strong, innovative and with meaning" as they explore lifes passions, ironies, love and politics using an eclectic mix of genres. If you get the chance to see Jeanette Murphy Band play, you can expect to hear a great selection of original songs, ranging from powerful grunge guitar crunches on 'Burning Bridges', to the smooth upbeat jazz swing of 'Two Busy'. The variety continues, with a country style on 'Back Home Again', and gives an acoustic melodic twist to 'One'. Yet throughout it all, this band makes it all sound coherent. The band currently have gigs coming up in and around London, and are looking forward to performing a few festivals next year. (see the 'Live' page for latest tour dates) They prefer to make each event special, with new songs, exclusive merchandise, plus a few 'giveaways' to their regular fanbase. If you'd like to be part of what we do JOIN OUR MAILING LIST for the latest updates. Previous album release and tour success as a solo artist with her debut album 'Biting' has included live and guest appearances on TV Shows, such as Showbiz UK, Ulster TV, C4, C5. Radio listings on Radio 2 & 4, GLR and IRN with live radio performances and interviews all over the UK and Ireland. This came about after signing a recording contract with OCEAN RECORDS back in 1995 (see below). As a professional singer, Jeanette has worked with a wide range of artists, musicians and writers on a range of musical projects from Eurovision Song entries, to professional session singing on tracks for Time Records (Italy), Eden Studios (UK), Clink Studios, XLR and Elephant Studios. On Stage - she has played support on appearance lists with SHANE McGOWAN & THE POGUES, NICK TURNER (Sax - Hawkwind), SUZI QUATRO, MICK TAYLOR (ex-Rolling Stones), ERROL (Hot Chocolate), JOHN CLARKE, LANDMARQ, JUMP, and the JOHN YOUNG BAND. 1996 - SIGNED A RECORDING DEAL with Ocean Records and released her debut solo album 'BITING' in April 1997. Promotional tour on National Radio and TV with London Today (Carlton Television), The Kelly Show (Ulster), Womans Hour (Radio 4), Olga Buckley and Johnny Walker Show (GLR). Radios Kent, Lincs, Norfolk, Leicestershire, and ILR's Moray Firth, and 2CR's Live and Dangerous Show with Graham Mack's Morning Crew. Also press reviews, including a 'Big Issue' article (by Tina Jackson) For more info see 'BITING' CD. 1994 - SOLO ARTIST 'unplugged' and 'songwriter' venues around London including The Troubador (West Brompton), 12 Bar Club, Kashmere, The Orange, The Chill and Acoustic Revolution. 1990 - LEAD VOCALIST - Formed IMAGE WOT IMAGE ? a psychedelic indie punk rock band with joint songwriter Gregg McKella (PARADISE 9) The line-up included bassist Debbie Vanozzi (GERTRUDE), lead guitarist Tyronne Thomas (ATV ), Drums MUFA, Mark Browne (modern jazz sax/horn/guitar etc). With NICK TURNER (ex Hawkwind) guesting at a festival gig in Wales. Together for 6 years playing Parachute Club, Lark in the Park, Finsbury, Reading festivals UK and Wales. 1985 - LEAD VOCALIST in rock band 'DIAL M'. Writing and co-wrote lyrics with JOHN FORD (Songwriter and band leader). ‘Self Survival’ was included on Jeanettes debut solo album ‘Biting’.